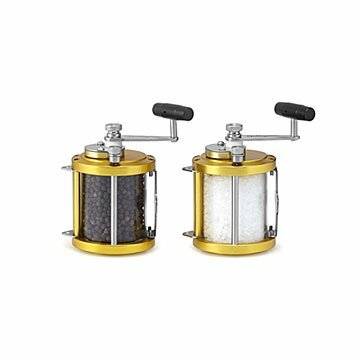 Patterned after a classic fishing reel, this set of salt and pepper grinders brings a nautical touch to your tabletop. Hard anodized aluminum and marine grade stainless steel combine with a ceramic grinding mechanism, allowing for perfectly ground seasoning. Spices included. Made in China. Click here to learn how to care and refill your Ocean Reel Salt and Pepper Mills. Every time we would use these, the screw to the handle became loose. So unique. Sturdy like a true fishing reel!! It's excellently made. I bought another set to give as a gift to friends that fish also. And they are raving about it!! It was a huge hit for everyone!! I love them myself!! Have bought several sets of these, including gifts for friends. Most recently purchased for my son and his wife as a housewarming gift. This one came without wood caddy base. Description clearly states caddy IS INCLUDED. Had I known it was not, I would not have purchased it! This is a wedding gift so I have not used it but it was nice to find a gift that reflected the groom (who is our friend) and still be for the bride as well. It added a nice touch of "him" to the kitchen mix. This was truly of quality work! My adult son is a highly skilled mechanic, welder , made his own motorcycle frame and modifies trucks.. for him to honesty say he loved this as he also loves to barbecue I know when he received it and by his comments it was a log good quality and that was important to me for his sake. For the price, I expected a lot more. The wooden base was loose in the box without any packing material or protection. The reels were in a separate box made from cheap, thin cardboard that had a cheesy image on the side. I repackaged the whole thing tossing the cheesy cardboard box and wrapping them all nicely in tissue paper and with padding. It's made in China and wish I'd known that before purchasing. Also, the reels were very small. I'm not an avid fisherman, but these were some of the smallest reels I've ever seen. For the price, I expected something a little bigger that would be a little more impressive. These reels look great and work well. The only issue I have is that the reels don't fit properly on the base provided so they sit a bit cockeyed. Bring a nautical touch to your table with these salt and pepper mills, patterned after a classic fishing reel.